Celebrate National Poetry Month this April, turn off your TV sets and read a good book! This April marks the 15th anniversary of National Poetry Month across Canada! Celebrate the power and beauty of words with your children, spouses, friends and colleagues. Turn off the TV sets for at least one day in April and spend time re-connecting through a diverse collection of oral and written works of poetry. And if poetry is not quite your thing, simply pick up a good book and read! Lest we relegate poetry to a lost art in this age of constantly evolving technology….we can all agree that ‘texting’ has done more than enough damage to the art of writing. 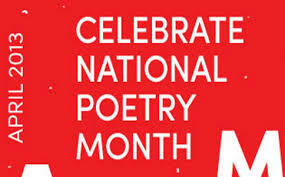 Established in Canada in April 1999 by the League, National Poetry Month brings together schools, publishers, booksellers, literary organizations, libraries, and poets across the country to celebrate poetry and its vital place in Canada’s culture. Communities and businesses participate through readings, festivals, book displays, and other events. The First Prize winner will receive $6,000, courtesy of the Canada Council for the Arts, and will have his/her poetry published in Air Canada’s enRoute magazine and on the Canada Writes website. He or she will also be awarded a two-week residency at The Banff Centre‘s Leighton Artists’ Colony (details about the residency here), and will be interviewed on CBC Radio’s The Next Chapter with Shelagh Rogers. A fee of $25.00 (taxes included) for administration purposes is required for each entry. For more information, visit this website: CBC Canada Writes. Celebrate National Poetry Month at the Central Library in Richmond Hill. Join the Whole Woman Network team there for a magical day of words. Richmond Hill Public Library will be joining libraries across Canada in celebration of poetry and its vital place in Canadian culture. Our celebration of Canadian poetry will take place on Saturday, April 6 at the Central Library from 1:00 – 4:00 pm in Room A/B, 2nd Floor. Six prize-winning poets are invited to read from their works to present an afternoon of poetic delight! Poets of honour include: Chris Banks, Barry Dempster, Susan Gillis, Susan Glickman, Maureen Scott Harris, and John Steffler. For additional information, visit the Richmond Hill Public Library’s website. ← Celebrating a Literary Giant: Rest In Peace, Chinua Achebe!